A hilarious comedy by David McGillivray and Walter Zerlin Jr.
Every drama group has experienced the horrors of what can go wrong on opening night, and the ladies of the F.A.H.E.T.G. Dramatic Society are no different, with the possible exception that almost everything that could happen does! 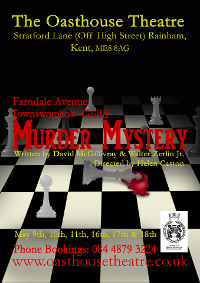 The scenery collapses, cues are missed, lines forgotten, and the sound effects take on a strange note at times, as the ladies present their ambitious evening's entertainment with the cunning whodunnit, "Murder At Checkmate Manor."